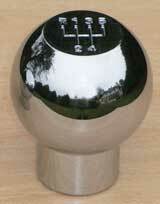 Very smart heavy chromed metal gear knob. 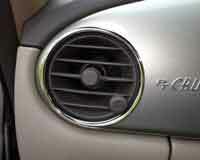 There are two versions with engraved gear positions for petrol and diesel PT Cruisers. Simple allen screw fixing, allen key supplied. Fits 2000 - 2010. 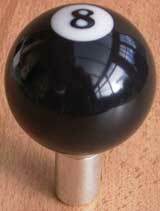 Large custom made gear knob using a genuine 8 ball. Includes chrome adapter and allen key. Fits only manual Cruisers. Fits 2000 - 2010. The PT steering wheel is well designed with its neat air bag housing and these shiny spoke covers certainly add to its style. Made from polished stainless steel they simply push on. Stylish chrome and satin finished metal key fob engraved with the Chrysler PT Cruiser logo. Packaged in black gift box. Four piece carpet mat sets specially tailored for the PT Cruiser. Good quality carpet in black with sewn-in driver’s heel pad and a non-slip backing. Only fits UK or right hand drive (RHD) PTs 2000 - 2010. 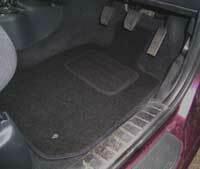 Heavy duty protective rubber boot/cargo area mat shaped to fit the PT Cruiser. Tough, waterproof and easy to clean, it is ideal for protecting the carpet. The mat also has a textured surface to help stop loose objects from sliding around. 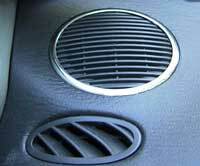 Chrome plated brass trim rings to surround the left and right dashboard air vents. Adhesive backed for easy fitting. Fits all 2000 - 2005. 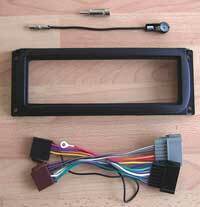 Chrome plated brass trim rings to fit the left and right dash-top speakers. Fit using supplied clear silicone adhesive. Fits all 2000 - 2010. A really impressive chromed ABS accessory that highlights the PT’s unique instrument panel. Fit using supplied clear silicone adhesive. Fits 2000 - 2005. These chrome metal rings fit around the control knobs, giving a more traditional look to the modern controls. Comes with instructions and adhesive for fixing them. Fits 2000 - 2005. High quality chromed brass door pins for the PT Cruiser. Simply screw on to replace the factory plastic ones. Set of 4. Fits 2000-2010. (Glue was used on some later models, make sure the existing ones will unscrew before ordering).